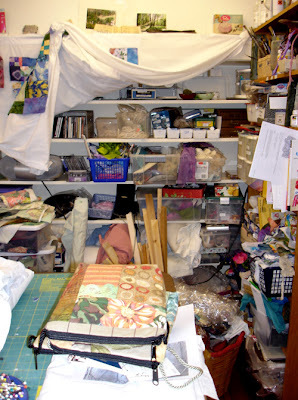 I share a large studio space in Lowell; my big work, my wet work, happens there. But the commute - three highways over 45 minutes -- means that most days I climb to the little third room upstairs, and cram myself in along with my two sewing machines, ironing board, cutting table, and carefully (hah!) squirreled supplies. On the third wall is my old faithful: an industrial sewing machine from the last century. 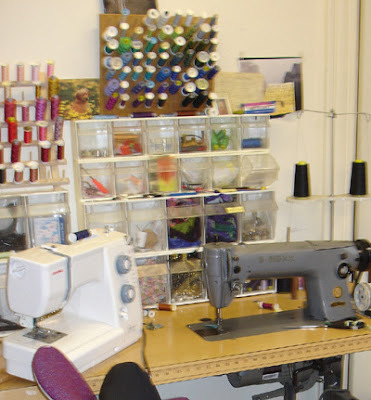 Next to it is my bottom-of-the-line Janome, the first sewing machine new sewing machine I've ever bought. Every other machine I've owned has been used, and all but one came to me through friends and family. None have had computers. For stitching I want speed, and occasionally zig-zag. That's it. The industrial one doesn't even go backwards, but, baby, it sure is fast. The stacked clear boxes behind it used to hold PlayMobile for my girl. The fourth wall is all window, facing due east. 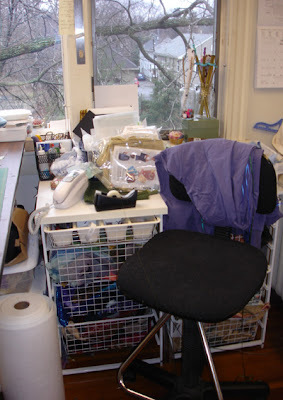 That wall holds active fabric in wire bins, and, at right angles, my cutting/work table. This is the heart of my days. I collage, paint, print, cut, draw and think here. Often I wish I had tables for each of these activities. O well! One plays with the cards one's dealt. 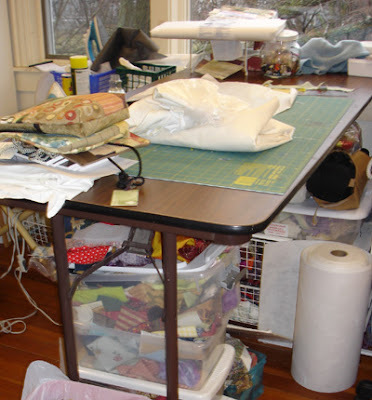 So, instead, this year, I am learning to CLEAN OFF the cutting table each time I leave the studio. Now interrupted projects do not layer like shale. Though still, finding work sometimes feels like an archaeological dig. When I stand at the work table, the second, built-in bookcase is behind me. It holds less-used materials such as batting and sheets. Because I usually have my back to it, projects posted there tend to get forgotten but at least do not get buried. Along the top, I file inspirational objects. 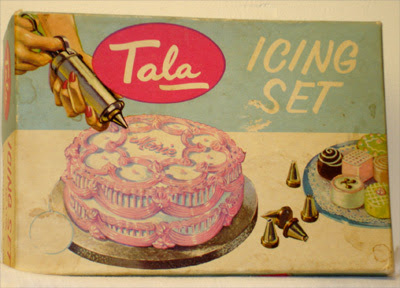 My current favorites are some beautiful tree photos, some old notions still on cards, and this relic, from my childhood days.